-OR is an EDG and an ortho-para director. 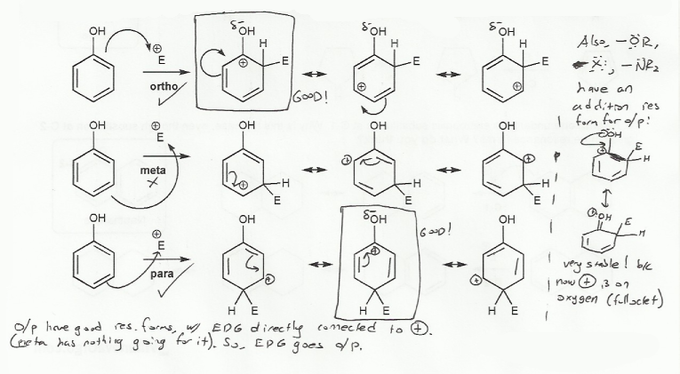 Let's draw an EAS reaction's cyclohexadienyl cation intermediates to demonstrate why this is true. I've started you off. What's good about ortho/para? What's bad about meta? Short answer: -OR is an ortho/para director because the cyclohexadienyl intermediates that result from ortho and para addtitions are more stable than those that result from meta addition. 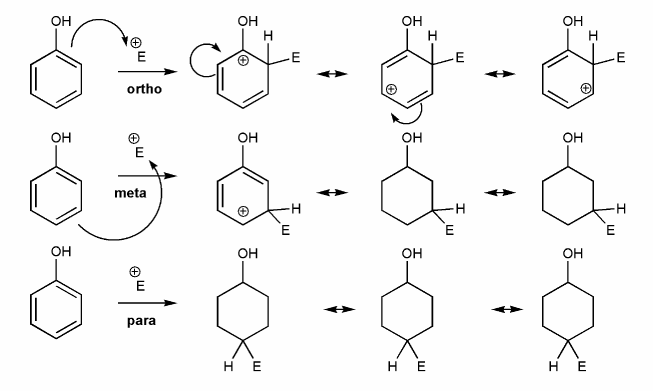 Long answer: The cyclohexadienyl intermediates from ortho and para addition include a resonance form where the oxygen is adjacent to the carbocation, while the cyclohexadienyl intermediates from a meta addition do not. When an oxygen (or anything with a lone pair) is adjacent to a carbocation, it can share its lone pair and stabilize the positive charge. This is only possible when the electrophile adds to the ortho or para positions, so those positions are favored with -OR as a substituent. Hence, -OR is an ortho/para director. Note that this logic holds for any substituent with a lone pair, so -OH, -OR, -NH2, -NR2, -F, -Cl, -Br, and -I are all ortho/para directors. MendelSet practice problem # 589 submitted by Matt on July 9, 2011.